It's that time of year in NYC when the weather isn't quite sure how to behave. 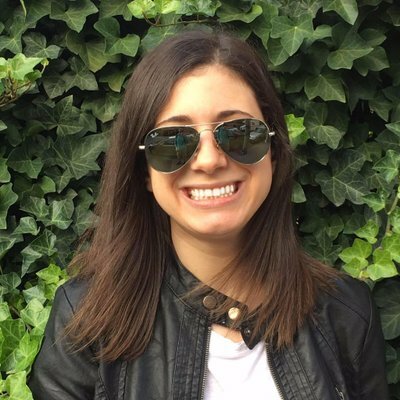 We straddle between warm and cold while making a checklist of things to do in spring. It's safe to say Mother Nature likes throwing us for a loop. 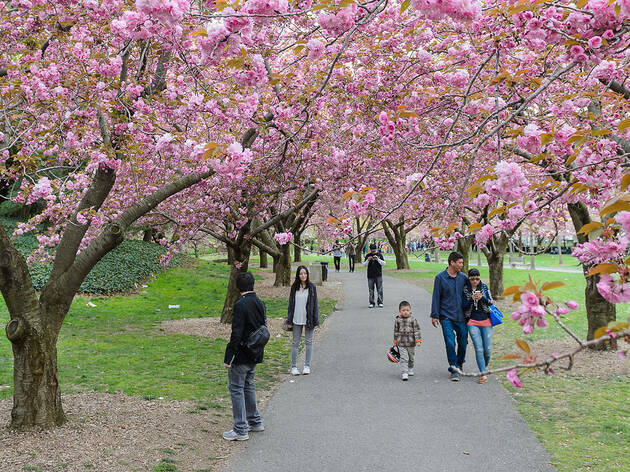 For those who are sick of wearing winter sweaters, we have some good news: Cherry blossom season is underway, and the gorgeous blooms are beginning to appear in our go-to gardens throughout the city. It's time to embrace the beautiful spring flower, and we have the perfect ways to celebrate the season with your little ones. There is no shortage of locations in NYC boasting the pink flowers. Although the Brooklyn Botanic Garden is the hot spot to catch these babies, don't forget to stop by other locales such as Randall's Island, Riverside Park and more. 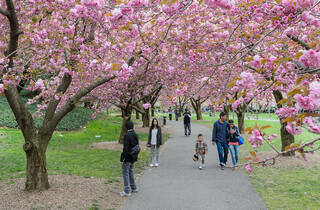 NYC's most beloved green space, Central Park, will host a variety of cherry blossom walking tours ($15). The dates are as follows: April 7 at 2pm, April 13 at 10am and April 18 at 2pm. Secure your spot on the NYC Parks website. On April 14 at 1pm, this cultural venue will host tots and their families for a floral festival ($15). Attendees will feast during an picnic under an indoor cherry blossom tree. When little tummies are full, kiddies will then craft their own magic-growing sakura tree as a souvenir! Visit Japan Society online to snag your tickets. Taste Buds Kitchen, which offers some of the best kids' cooking classes in NYC, will invite kids (ages 5–8) and a caregiver to make flower cupcakes on April 28 at 9am ($45). Visit Taste Buds Kitchen online to register. From April 26–28, Wave Hill will host a variety of Arbor Weekend events (various prices). Kids will want to get in on the action at the Junior Arborist Station (April 27 from 11am–3pm), where Almstead Tree, Shrub & Lawn Care will help youngsters (5 and up) to ascend into the canopy of an old black cherry tree and get a whole new perspective of the Bronx venue. Visit Wave Hill online for more information. The week of April 8, Private Picassos in Park Slope will offer mixed media cherry blossom paintings ($20) as its weekly special. From April 19–28, Brooklyn Children's Museum will host its Earth Rocks! festival, where children will be able to contribute to the community meadow sculpture, part of which includes a cherry blossom tree that was crafted during Lunar New Year. On April 22 at 11am, kids can attend a silk flower workshop with guest artist Blanka Amezkua in the museum's Color Lab. Although cherry trees don't necessarily thrive in terrariums, the founders of Twig Terrariums will still celebrate their "ethereal charm" with a children's terrarium workshop on April 28 at 3:30pm ($45), during Brooklyn Botanic Garden's Sakura Matsuri.